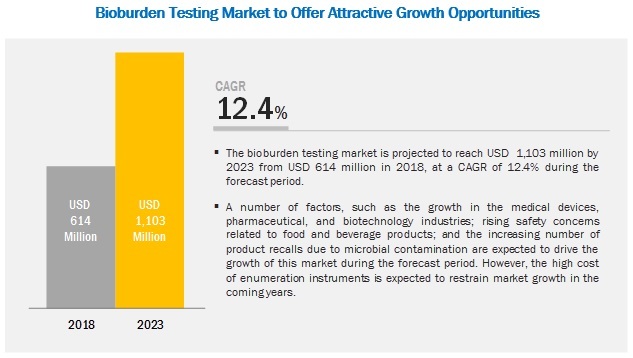 According to the new market research report "Bioburden Testing Market by Product (Consumables, Instrument (PCR, Microscope)), Test (Anerobic, Mold/Fungi, Aerobic, Spore), Application (Raw Material, Medical Devices, Sterility Testing), End User (Pharma, Biotechnology, CMO) - Global Forecast to 2023", published by MarketsandMarkets™, the Bioburden Testing Market is projected to reach USD 1,103 million by 2023 from USD 614 million in 2018, at a CAGR of 12.4% during the forecast period. The growth in this market is mainly driven by the growth in the medical devices, pharmaceutical, and biotechnology industries; rising safety concerns related to food and beverage products; and the increasing number of product recalls due to microbial contamination. Don’t miss out on business opportunities in Bioburden Testing Market. Browse in-depth TOC on "Bioburden Testing Market"